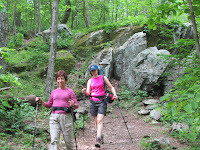 After the wet day earlier this month, we resumed the relocation of the Appalachian Trail. Eight people were present on Saturday. 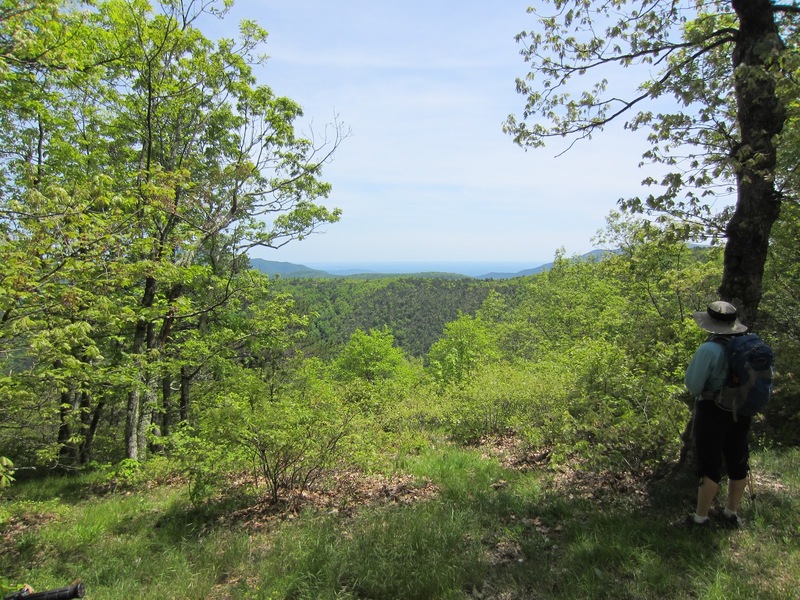 Andy Willgruber and Don Davis arrived first, and Andy mowed a path from the current Appalachian Trail to where the new trail enters the woods before others arrived. It looked so good that some people took the new trail until two workers put some branches over it. Andy and Don then went to mow some of Little Calf Mountain. Along the way, they encountered an 18” tree in the way. Don quickly cut it, so they reached their goal. Then they mowed a strip that will become the Appalachian Trail and that is currently the road Andy uses to drive a mower to the top. Andy started clearing Calf Mountain nearly 9 years ago, and he says his truck is showing the effects of age. On the other hand, the mower was a sight we have not seen for a while: it was the mower used earlier on the project, before PATC bought a new one. No one had any interest in the old mower, and after it sat for several years unwanted by all, Don took it home and revived it, to Andy’s delight, because he prefers the higher deck of the old mower. It takes the Don Davis touch to start, but it worked. After mowing, Andy and Don joined the group digging in the dirt. The rest of the group headed to where we left off 2 weeks earlier. We donned our hard hats, which not all crews do, but our crew chief wanted to protect us. 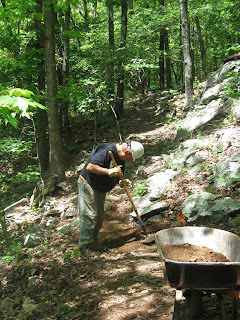 The first task was putting more soil on the section of trail behind the rock crib wall built earlier this year. 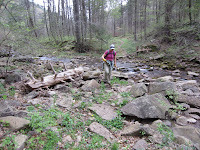 The trail looked good, but we wanted to raise it because of expected settling, and to make the trail higher than the rock wall so that water will run off the trail. There were a couple of spots nearby where we also wanted to raise the trail to make it easier to walk over a couple of large rocks. 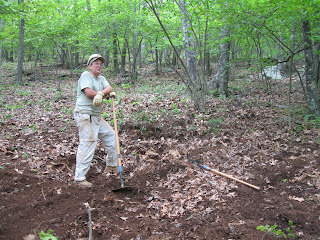 The perpetual activity for the 2 days was digging up good trail earth and transporting it to a site on the trail. 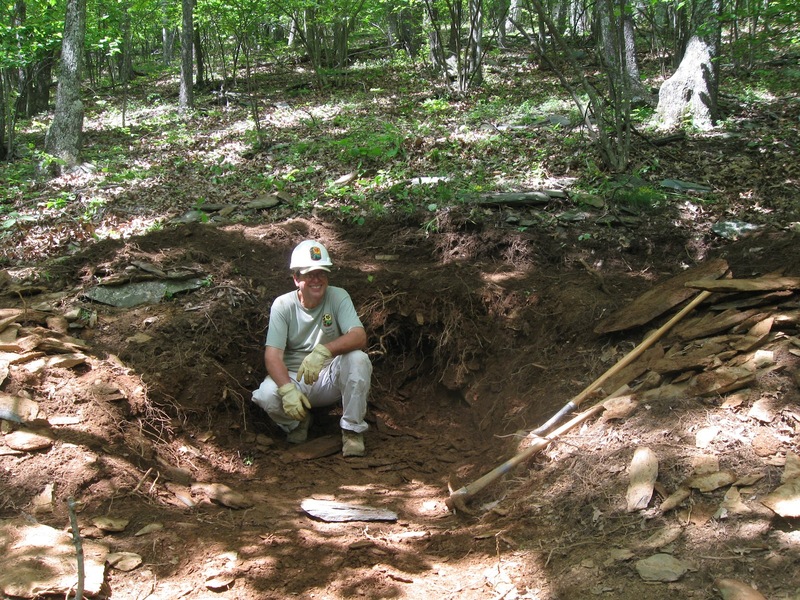 This involves something seen on few trail-building projects—making a borrow pit, a hole where we dig out good soil; this activity is disruptive so not allowed in Shenandoah National Park. 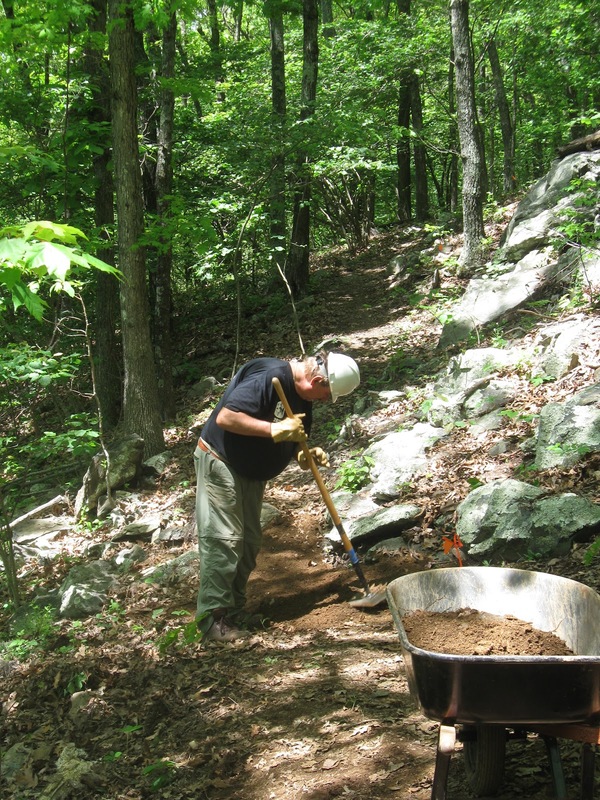 No established mechanism is in place to repay the removed soil, but if borrowing money that may not be repaid is good enough for some governments, it is good enough for volunteer trail builders who spend their own money to get to a trail building site and to be equipped for work. 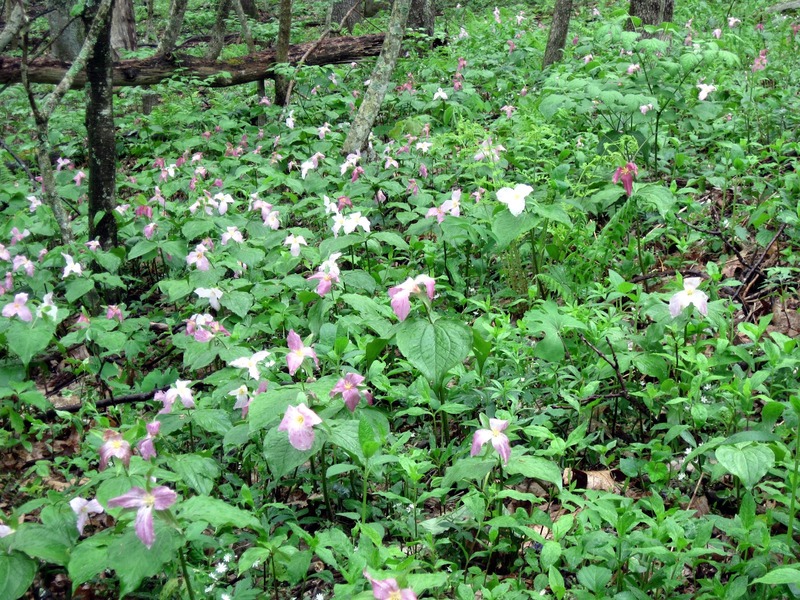 The first step is choosing a site, preferably close to where the soil is needed, but not staring at people on the trail. Then comes removal of the layer of vegetable matter, which easily disappears if used as trail bed. Then after digging up the soil, somehow we had to move it. At this point, John Shannon’s cats helped, supplying a couple of buckets which once held kitty litter. (One of the cats wanted to be in the outdoors, because the Appalachian Trail is in SocrATes’ name.) We carried soil to the trail in the buckets and most of the time put the soil in a wheelbarrow to take it where needed, which crew chief Don White bought for his house but uses more on trails. Some of the time we carried buckets to the work site. Around lunchtime, the cribbing project was finished, so we turned our attention to another trouble spot where a rock partially blocked the trail. One person decided the solution was to remove part of the rock, which he did with a rock bar and sledge hammer. We completed the project by partially burying the remaining rock with soil from another borrow pit. At lunch we discovered something new. One person declined lemon raspberry cake, not because he thought it was junk food or lacking fiber, but because he is allergic to raspberries. While most people continued to rearrange soil, a couple of people, including Andy Willgruber, started on another new concept: the relo relo (r squared). 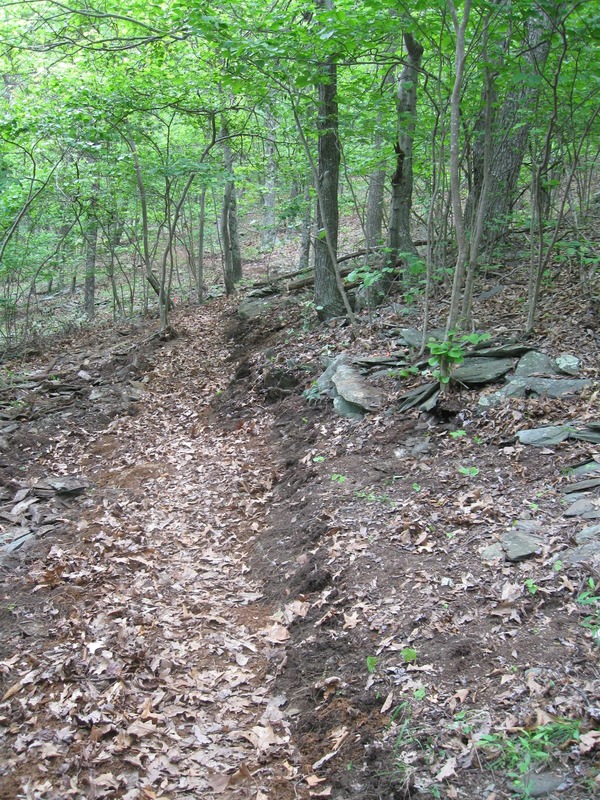 One section of trail, which passed through a rocky section, was a little low on the hill, perhaps because the people who built it decided, with justification, that going higher took the path into an area where you cannot build good trail, but crew chief Don White is determined to build the trail right. Two people moved enough small rocks to make a new path, which had a poor walking surface, although acceptable in some places. 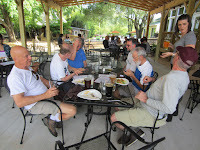 By now it was time to stop, so after cleaning tools and spraying them with WD-40 from the Charlottesville Chapter, most people headed to Schairer Trail Center for dinner from Mary Jorgensen of Dunlodge cabin fame, and drinks unsuitable for our 14-year-old crew member. Next morning was a first—John Shannon was the first to arrive at the work site, but Mark Gatewood arrived soon after. Anticipating a wait for others, John headed to the beginning of the new trail to slow down some invasive, tree-strangling bittersweet. Four of the Saturday crew returned to improve the relo relo. We returned to a hole used two weeks earlier to provide trail soil. This borrow pit was not very close to a tree, so there were few large roots However this pit was a little distance from the trail so there was the extra task of carrying soil to the wheelbarrow . Three people worked at the hole, where Don Davis showed his expertise in digging holes. Mark Gatewood, the master trail builder and renovator, who says he learned about trail building from crew chief Don White, used the soil to put an easily walked surface on the new section of trail while Don White tidied up some other spots, and started filling and covering other borrow pits. Chocolate raspberry cake accompanied lunch. 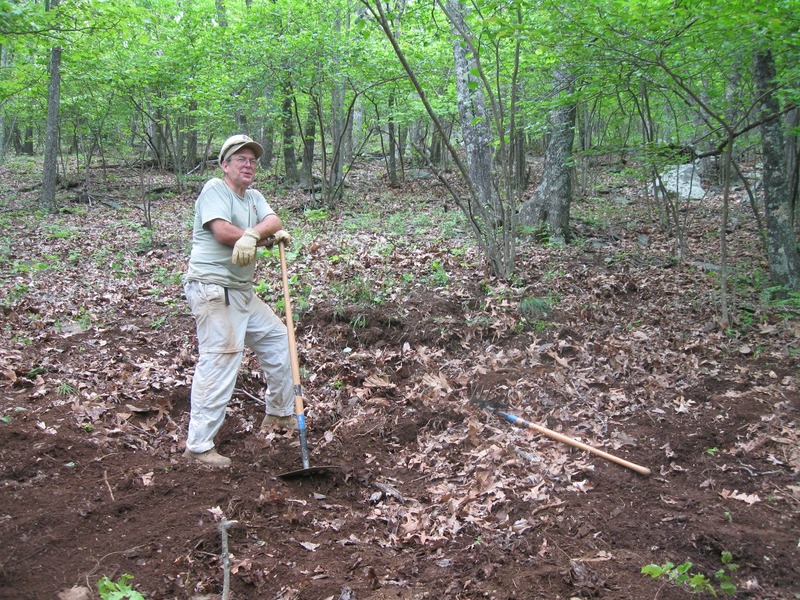 After clearing away more vegetable matter to expand the borrow pit, word came that we only had to fill the wheelbarrow two more times before we largely filled the hole with rocks and the soil we scraped off. The new section looked like normal good trail, not the rough path made of slippery little rocks that it was in the morning. Finally people could start their trips home, which would take some 2 or 3 hours. Because of multiple commands to take breaks, people ended the day without being exhausted, or injured, so they can come back another day. A number of people had signed up for the relocation project the week before, but some were unable to attend today because they had made other plans prior to the rescheduling. So when John Shannon arrived at Beagle Gap at 9 a.m., he did not see any familiar people or vehicles but discovered to his surprise that the two young people waiting had come to join the relocation project. After the arrival of crew chief Don White one other helper, so the five of us started to the work site. The plan for the day was to concentrate on completing some rock cribbing by filling space with small rocks and soil. Some of us collected suitable sized rocks, while one person broke the larger pieces in to the preferred size for fill. Two of us then started looking for a suitable place to dig out some clay soil to make a new trail surface over the rocks. We moved the soil by bucket to a wheelbarrow, and the first priority was filling a low spot on the trail that was difficult for the wheel barrow to negotiate. Light rain started late morning, but unlike a week earlier, it was not cold. After lunch, a couple of people traded tasks, with two or three digging out clay while others compacted the soil on top of the rockbed finished earlier. 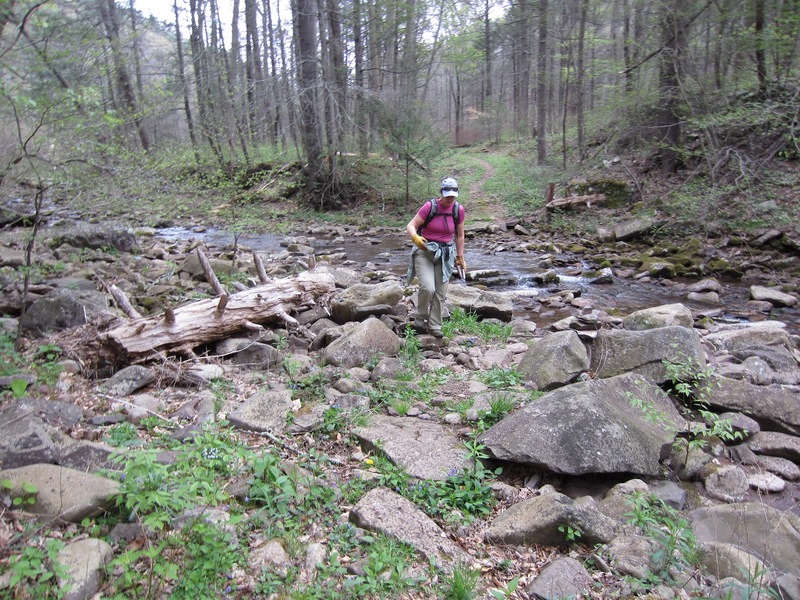 After participating in a major trail repair project, Mark Gatewood came to see what was happening. The drizzle made things messy, and just before the rain became heavier, Don White said it was time to stop. By the time we reached the cars, the rain slowed. Cleaning lots of mud off tools was messy, but we had enough water to rinse most of the mud away. 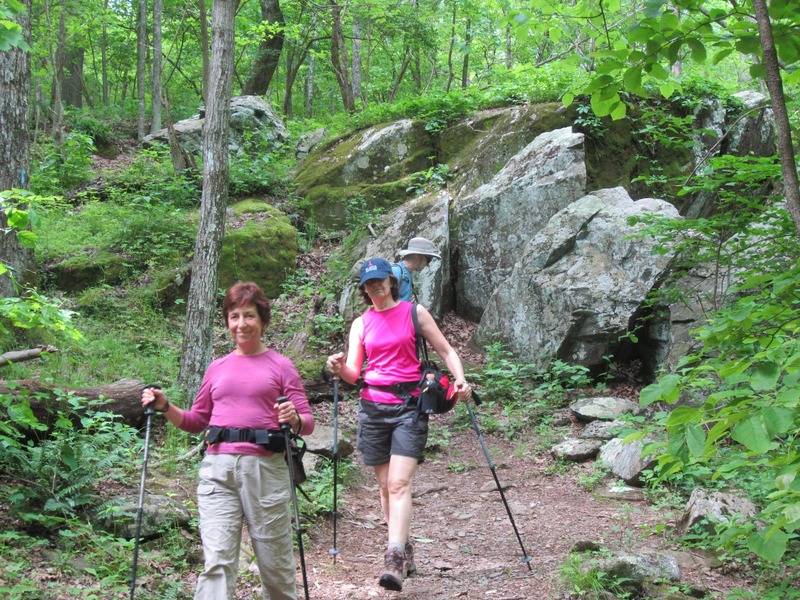 The two new people found the experience interesting and said they would join more trail-building and repair trips, possibly closer to their homes in northern Virginia. With fear of rain Sunday and only a handful of people committed to showing up, Don White cancelled the Sunday work and announced continuation the project on May 19-20. On Sunday, three members of Charlottesville Chapter and several other PATC members had lunch with Dan Vining and his wife, who made Dunlodge available to PATC’s cabin system. 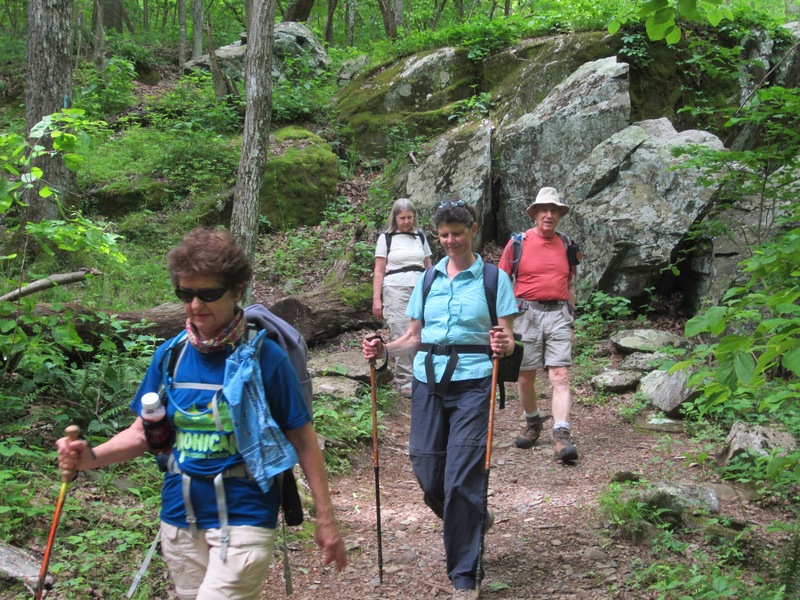 The Saint Mary's Wilderness hike is more or less a standard annual affair for PATC - Charlottesville Chapter. 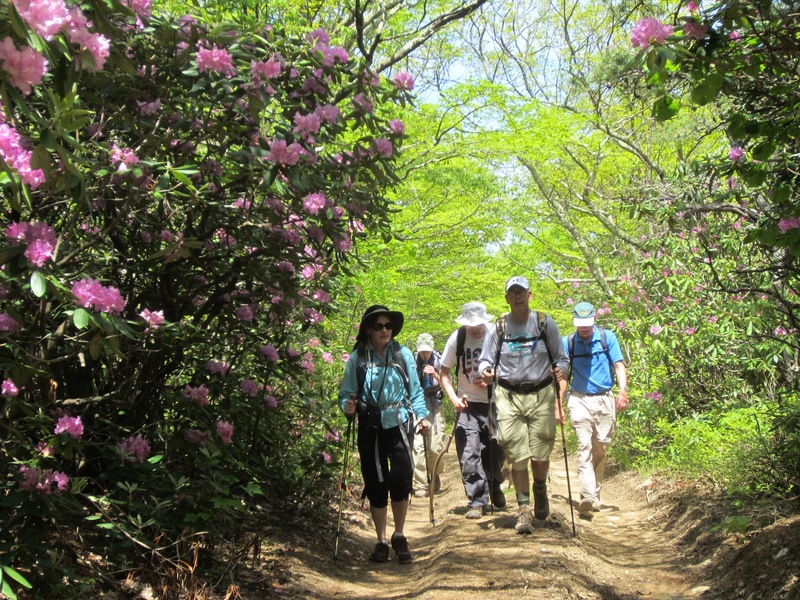 We have done this hike at other times in the year, but the ultimate is to catch it when the rhododendron are in bloom, as this circuit is renowned for the multitude of rhododendron along the route. However, catching the bloom is somewhat a hit or miss deal, as our recent efforts have demonstrated. The normal peak is the first week in June, but with the mild winter and warm spring we have experienced, hike leader Ken Moss opted to gamble on an early bloom this year, so scheduled the hike a couple of weeks earlier than normal. As the fateful day approached, Ken was gratified to come across several internet postings suggesting that the bloom had indeed arrived early this year and was already well in progress. 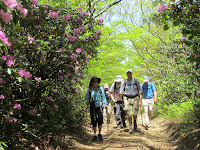 Thus a relatively small group of hikers assembled at Albemarle High School, including member Pat Skelly and friend Arnold Newman, who had traveled all the way from Augusta, Georgia, just for this hike! Despite the small crowd, we drove to the trailhead in four cars, as the majority of hikers hoped to make a stop by the new Wild Wolf Brewery in Nellysford on the return trip, while unfortunately both Marian Styles and Anne Colgate had separate later engagements which precluded their participation in any après-hike festivities. 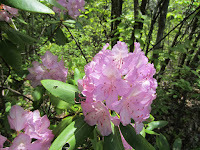 After the standard introductory words, safety brief and explanation of the gamble we were taking on finding blooming rhododendrons this early, the group left the parking lot and headed westward toward the mountains. 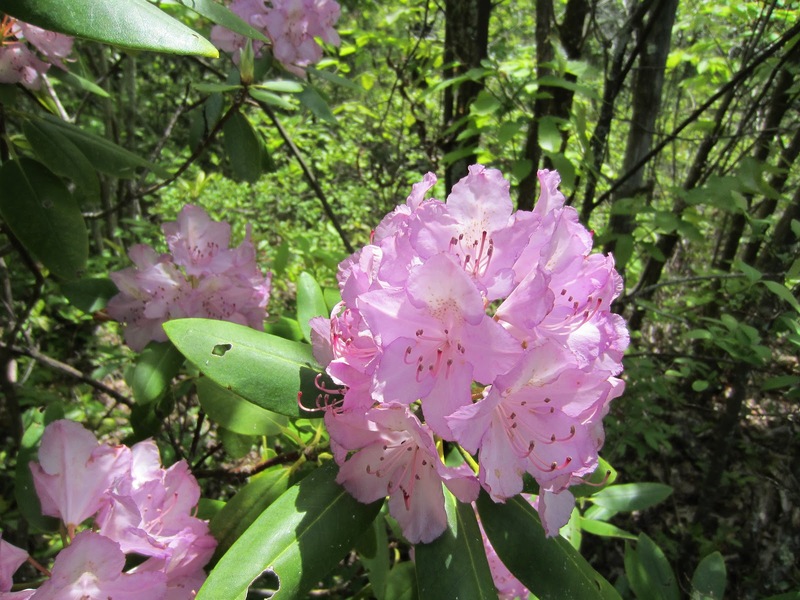 On the drive along the Blue Ridge Parkway to reach the trailhead, sharp-eyed observers noted the occasional rhododendron in bloom, providing a sense of promise for a successful excursion. 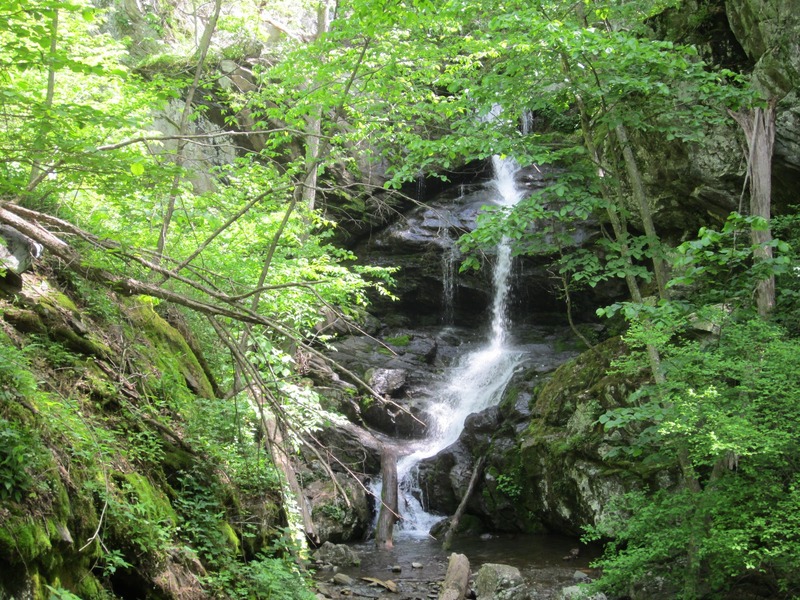 Once at the trailhead, where we were met by Michael Seth, we descended into the Saint Mary's Wilderness Area along the Mine Bank Trail, which took us down into the valley of the Saint Mary's River. 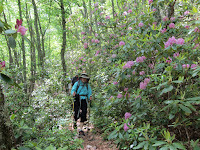 Soon enough, we began to see impressive stands of flowering rhododendrons at their peak of bloom, causing a plethora of "ooh's" and "aah's" from the group and a pleasant sense of relieved vindication on the part of the hike leader...we had apparently nailed it for the hike date! 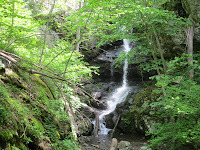 Following the descent, and an initial crossing of the Saint Mary's River near the ruins of an old mining operation, we headed north along the Saint Mary's Trail, which started out relatively flat for an easy stroll through the woods. 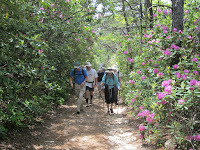 Soon, though, we began the ascent toward Big Levels, a rather steep section which can be challenging on hot, sunny days. 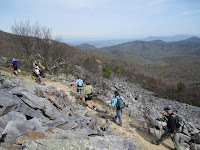 We were fortunate to have pleasant temperatures and low humidity on this day, so the ascent wasn't as difficult as it has at times seemed in the past. 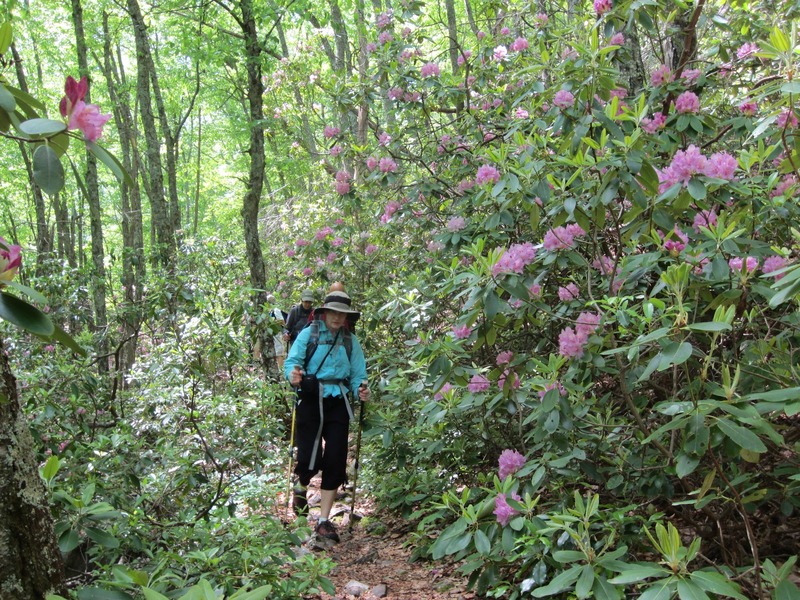 Blooming mountain laurel dominated this part of the hike. Upon reaching the Big Levels ridgeline we left the Wilderness Area, causing one hiker to quip that hiker leader Moss lacked only an "e" in his name to make the act of leading his people out of the Wilderness even more auspicious! 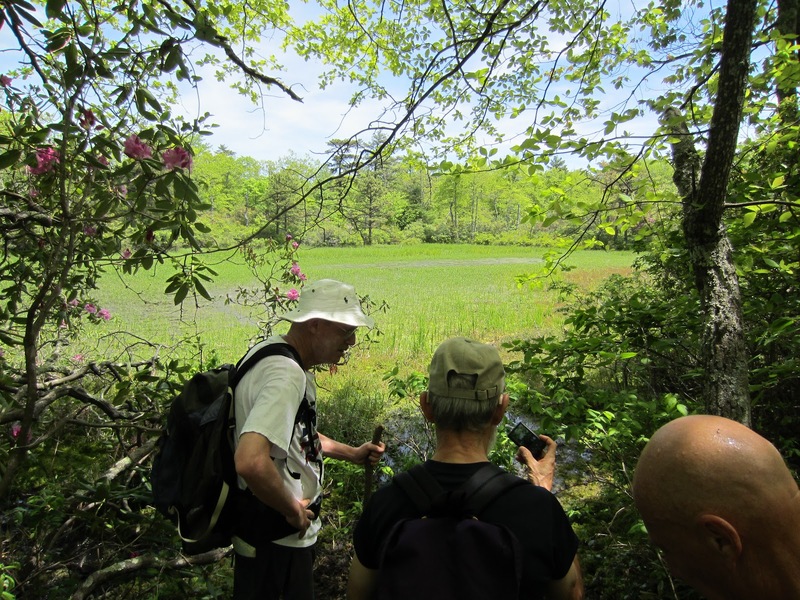 We turned right upon the faintest trace of an overgrown trail and made a stop by Green Pond, a rare natural mountaintop wetland, though it is often not more than a marsh covered with green algae and reeds. Continuing on the trace, we emerged on Forest Service Road 162, where we took a well deserved lunch break. Following lunch we continued along FSR-162 for several miles, often surrounded by a veritable gauntlet of blooming rhododendron and mountain laurel, until reaching the very discreet intersection of the Bald Mountain Trail, which took us down into a thickly canopied draw before finally intersecting with the Mine Bank Trail again and returning to our cars. 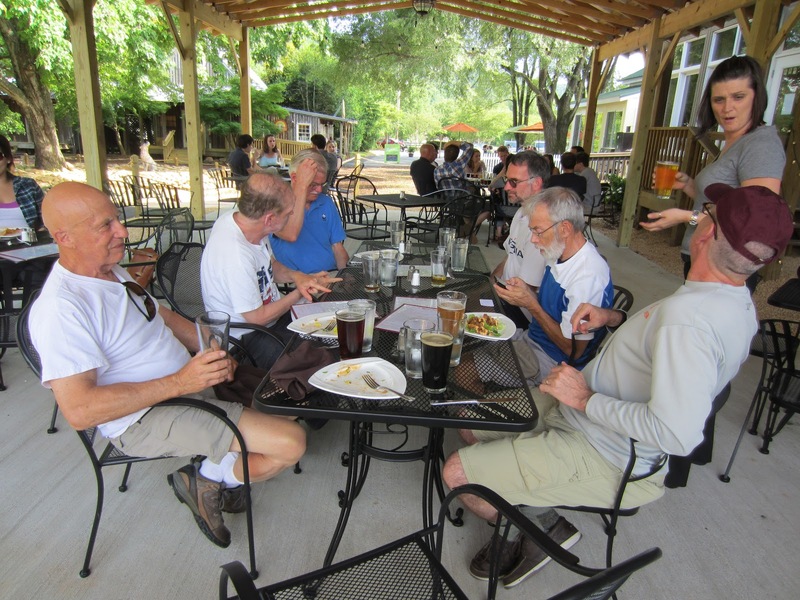 With our only two females leaving us in their separate cars at this point, the remaining all-male group, including Pete Fink, John Brandt and Maynard Davis, headed off for a very enjoyable refreshment phase at Wild Wolf. All agreed that this was the perfect ending to a wonderful day on the trail! A slightly overcast, but otherwise pleasant day, with low humidity and comfortable temperatures, greeted a relatively small group of hikers who assembled at Albemarle High School on a Saturday morning for the annual spring rite of passage known as Jones Run / Doyles River. 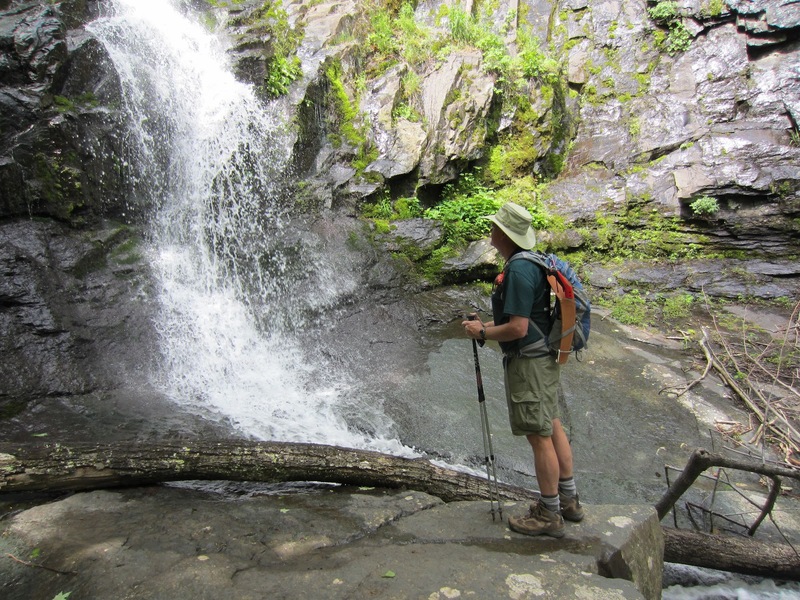 The hike leader, Ken Moss, likes to do waterfall hikes in late spring when the water levels are most conducive to a good water flow and cascading display. Others seeking the same experience on this day included John Shannon, Eric Christensen, Bev and Pete Fink, Sue Tansey, Rita Kieffer and Marie Moss. 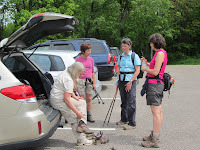 Upon arriving at the trailhead at the Jones Run parking area off of Skyline Drive, we waited a bit longer for one last hiker coming from Staunton, Barbara Martin. After waiting for about 10 minutes, we prepared a note to leave for her…this incantation was enough to produce Barbara, who pulled into the parking lot as we were positioning the note under a windshield wiper for her. The entire group was soon on the trail. The descent down Jones Run Trail was without incident. We paused for a short break at the falls along Jones Run, which displayed a worthwhile water flow, though not nearly as impressive as last year. As this seemed to be an impatient group, so we soon forged on downhill, passing one of the largest trees in the Park before arriving at the junction with the Doyles Run Trail. The uphill stage then began and was moderate enough until we approached the lower Doyles Run Falls, where the trail became steeper for a time. 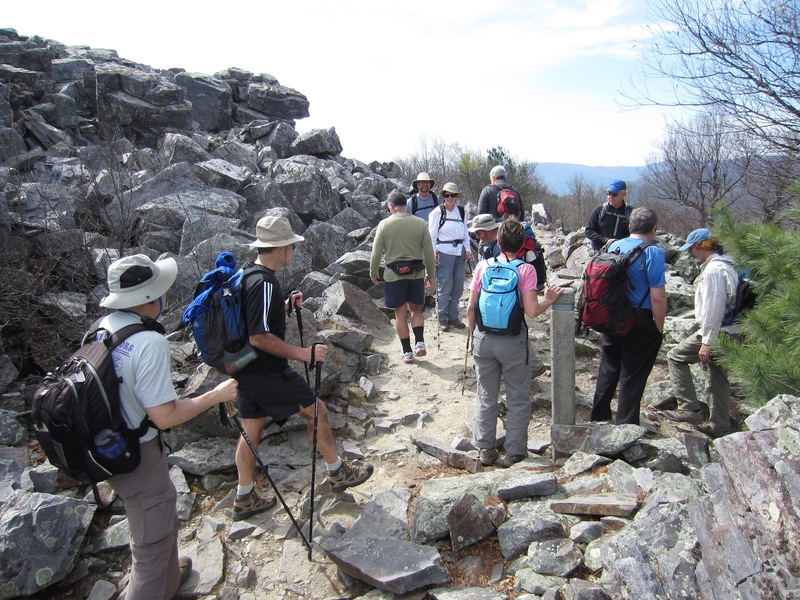 As we had already passed the noon hour, it was at this point the hike leader attempted a never-to-be-repeated effort at democracy on the trail, offering people the choice of lunch in place at the lower falls or continuing uphill to lunch with a view at Big Run Overlook along Skyline Drive. At first the decision was split, with half wanting an immediate halt and the other half preferring to finish the climb before dining. 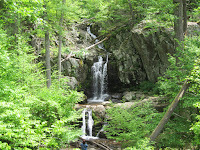 John Shannon then introduced the possibility of lunch at the upper falls…so we headed in that direction. 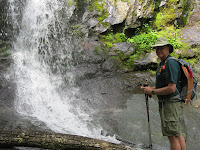 Upon arrival at the upper falls, our less than nimble-minded leader again offered the choice of stopping or continuing. 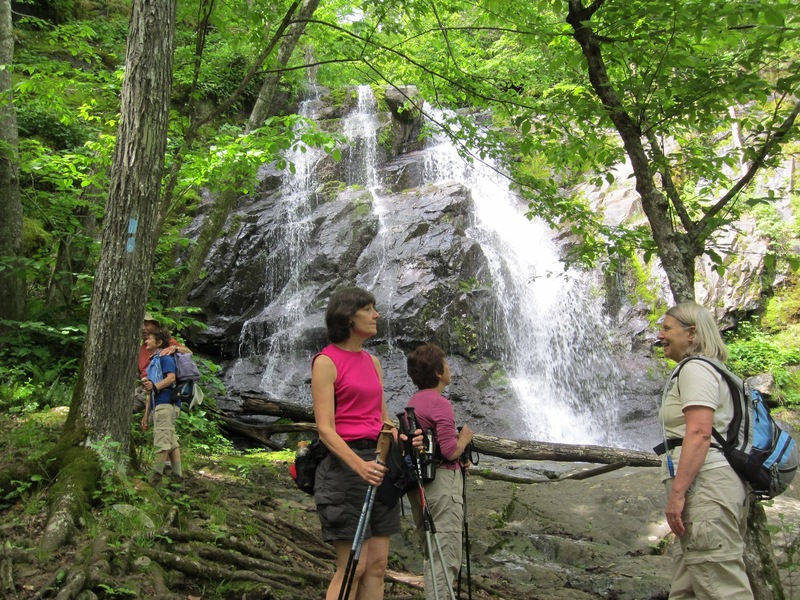 John, Rita and Barbara decided to head down to the falls for lunch as the others debated…and soon decided to continue to the top, not wanting to make the remaining climb on full stomachs. 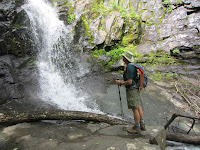 Incredibly, our far from astute leader accepted splitting the group, and descended to the falls to ask John to take charge of the stay behind party while the rest climbed up the trail for lunch at the overlook. John was with Barbara, who soon decided that she would rather stay with the larger group, so she left to rejoin the group. John, thinking that everyone else had already left, started the climb to rejoin the group as well. Rita had meanwhile settled in by the falls for a pleasant, unhurried lunch with a view of cascading water. Soon, however, she noticed that something was not quite right…where was everyone else? She was alone…apparently abandoned by the rest of the group. John had not realized that Rita had descended to the falls ahead of him and thus, theoretically, was one of his stay behind charges. After awhile, John caught up to the main group and was queried about Rita. Realizing the gaff, and true trooper that he always is, John rushed back downhill to gather a somewhat lonely Rita in order to bring her back into the fold. 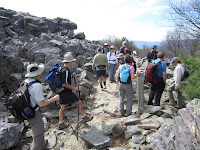 Upon reaching Big Run Overlook, the now reunited group spread out along the rock barrier wall for victuals while admiring the Big Run watershed, largest in Shenandoah National Park, before us. 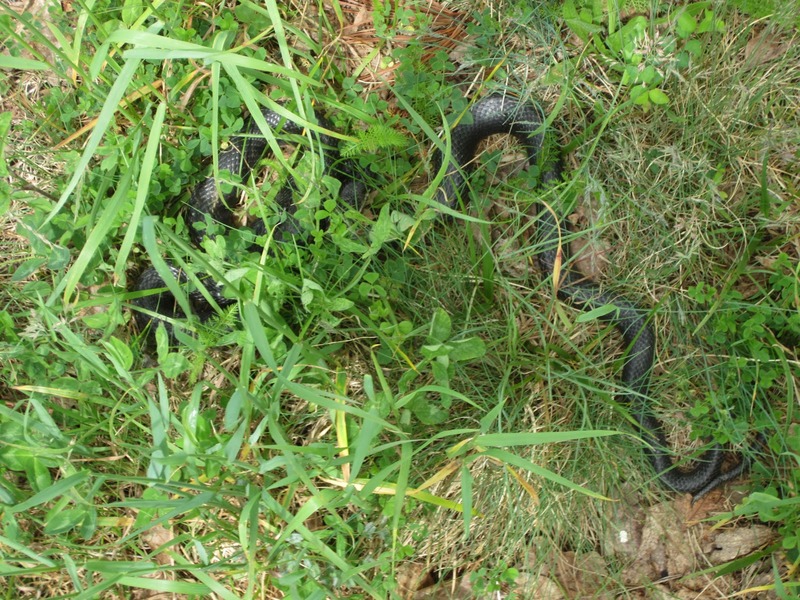 Suddenly, Rita bolted from her seat with a scream…she had finally noticed a rather large black snake curled up directly at her feet in the tall grass! 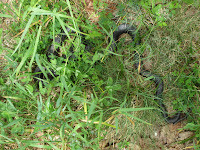 This caused both concern and amusement among the group, particularly after determining that the serpent was dead. Still, it was obvious that Rita was hardly leading a charmed life on this day! 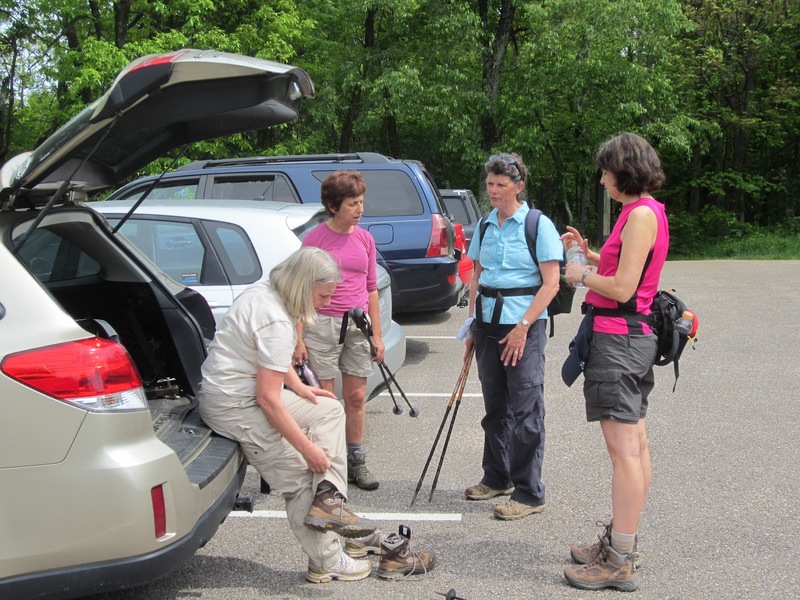 The return to the parking lot along the Appalachian Trail was uneventful. 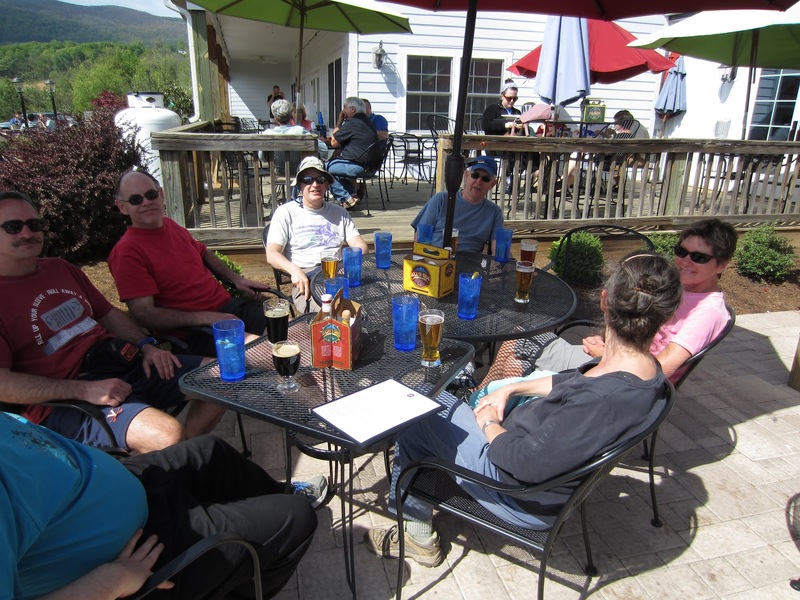 Following the hike, the entire group, at the leader’s suggestion, stopped at Blue Mountain Brewery for rejuvenating refreshments…a great way to finish off yet another great day on the trail! An enthusiastic group of hikers gathered for the long drive past Buena Vista to the Thunder Ridge Wilderness on a Saturday with rain threatening. As it was SAT testing day at AHS, we assembled in the middle of the parking lot to break into carpools depending on whether folks wanted the optional post hike stop for Mexican food. Leon and Baley drove Maritza Hartnett, as her husband, Jack, needed to be at work at Blue Ridge School late in the afternoon, so did not have the time for the long commute. Jodi Fredericksen and Dave Abdullah joined us again to see a rare part of Virginia before their upcoming move to Delaware for Jodi's grad school. David Ledbetter gave his bike a rest, from training for his upcoming Ride the Rockies, and joined our hike on his way to hear his brother's band play at a winery in Buchanan. Joining us all the way from Augusta, Georgia, was Pat Skelly, whom Ken Moss had notified of our hike, despite not being able to attend himself. We all headed south in 6 cars. Upon arrival at Petite's Gap, our co-leader Michael Seth was waiting patiently for our arrival while Barbara Martin was waiting at Sunset Field, the beginning of our hike. The weather was ominous, but we set out with several of us sharing gear with others who had been more optimistic about the forecast. 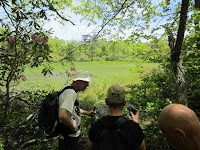 With the extensive botanical knowledge of Michael Seth, we began our hike north a few minutes before noon. The fast hikers, Steve Cohen, Briana Taylor, Jodi, Dave, David, and Maritza, led us north on the AT, with Dan Ralston and Bill Holman running sweep. CJ Woodburn spotted a rare yellow lady's slipper, admired by those taking the time to search on the way up to the former WW II defense site on Apple Orchard Mountain. 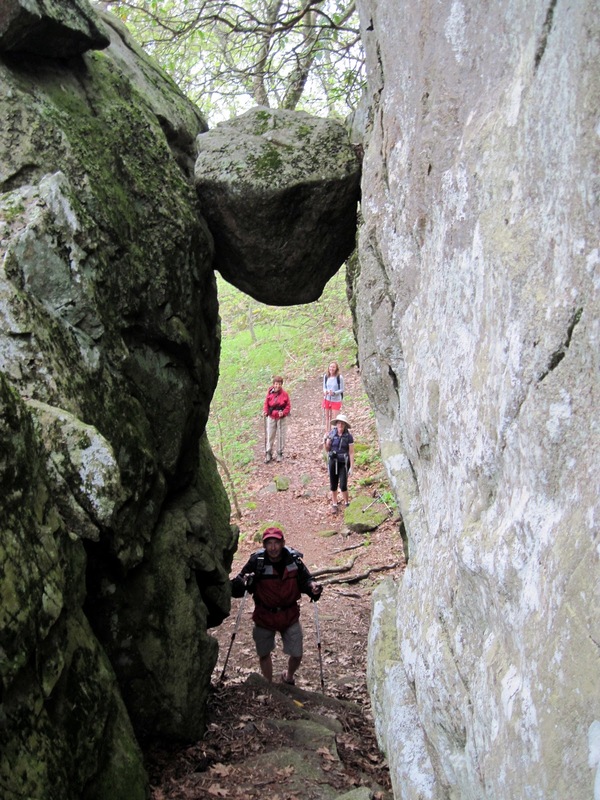 At 4225 ft, it is the highest point on the AT between Chestnut Knob near the Tennessee border and Moosilauke, NH . 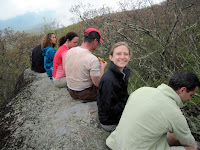 Here we all indulged in lunch, sitting on the slippery rocks. Dennis Templeton, Dave, and Bill climbed high on the rocks and took some great photos, while we ate lunch, and shared stories and cookies. 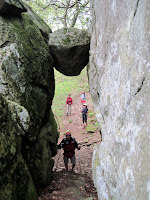 Most of the hike after lunch was downhill, passing under the famous guillotine rock. 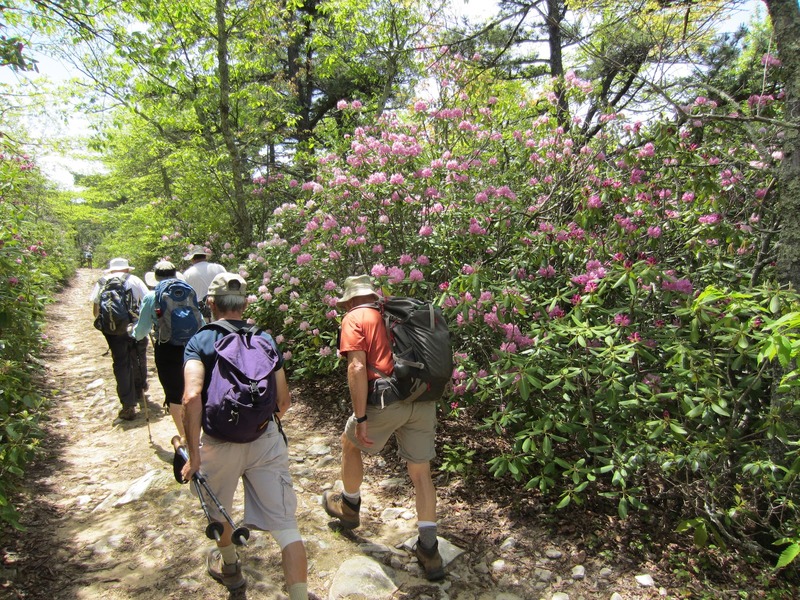 Marian Styles, Paige Madison, Dave Borszich, and Dan Funkhouser enjoyed the rocky trail, as we approached the main event- the hillsides covered in trillium. Stunning, as advertised, they were a pale pink carpet in the woods, truly amazing. Other flowers we saw this day (according to our hike leader Michael Seth) were big flowered trilliums (gandiflora), yellow lady slippers, wild parsnip, golden alexanders, sweet cicely, wood anemone, rue anemone, common violets, birdfoot violets, speedwells, dwarf cinquefoil, goosefeet, wood-bettony, wild geraniums, squawroot, Virginia waterleaf, pussytoes, star checkweed, Canada May lilly, May apples, solomon's plume, solomon's seal, perfolitated bellwort, common fleabane, pink azalia, rhodendron, wild strawberries and spiderwort. Andy Willgruber and Iva Gillet slowed their pace to admire the beauty, while those more wet and chilled kept their pace. As nature sometimes does, we finished the hike with dripping weather, so while carpoolers huddled under umbrellas and the kiosk, car drivers reversed the shuttle. David Ledbetter headed off to drink wine and listen to music, Briana took a carload of wet hikers straight back to C'ville, as did Leon. The rest of us were eager to warm up inside and out with Mexican food, margaritas and beer, all while watching the Kentucky Derby. It doesn't get any better that this! Good food and good times were had with $1.99 margaritas and beer for Cinco de Mayo at Don Tequila's in Buena Vista. As nature does often, we arrived there wet and cool, but after our meal and the race, it was sunny and warm. We all headed back to our respective homes after a great day of hiking and friendship in one of nature's loveliest spots. 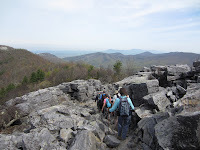 After some people made arrangements to participate in the AT relocation at Little Calf Mountain, the weather changed plans by threatening rain and thunderstorms. Don White, crew leader for the project, had to decide two days in advance to either proceed with the project or cancel to avoid having people working in rain and lightning. He chose the latter. 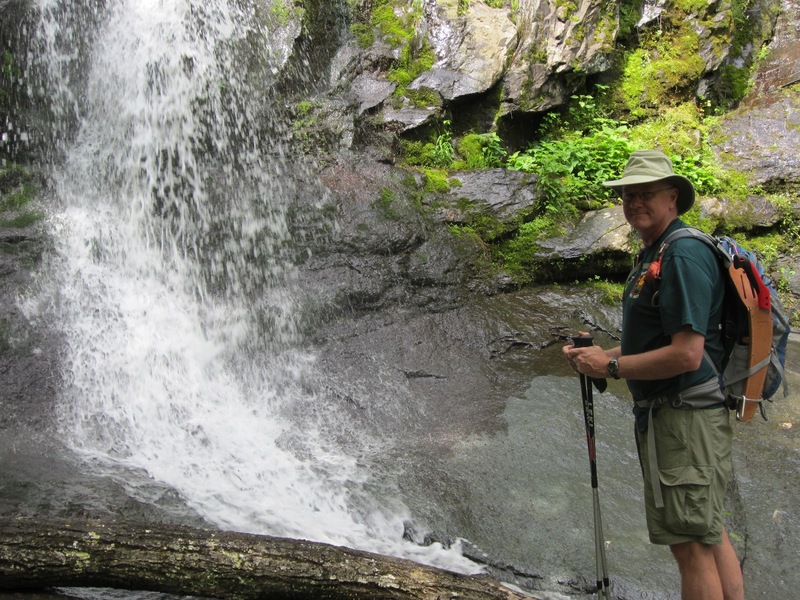 So John Shannon swapped his work tools for hiking boots and led a hike. 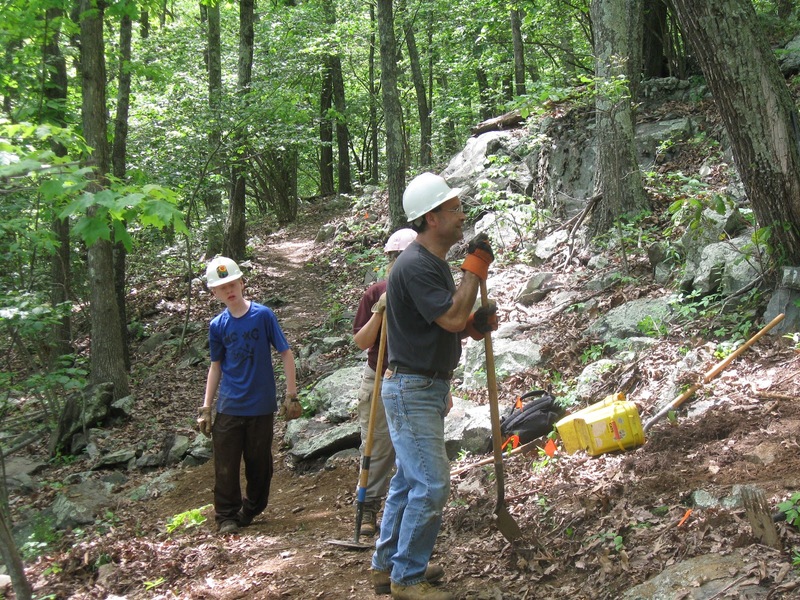 We started at McCormick Gap and crossed over Bear Den Mountain, noting both the steep trail sections that have led to a proposal for a trail relocation and the lack of significant new erosion resulting from work several years ago by Flying McLeods and trail maintainers. We stopped at the famous tractor seats but saw little beyond the nearby small trees. 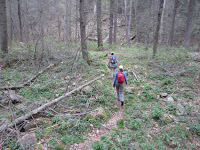 On the other side of Beagle Gap, we took the partially constructed new Appalachian Trail. Halfway to the summit, we found that canceling the work trip had been a good decision as cold rain started falling on us, which combined with a breeze, made us quite cool for late April. The rain didn’t deter us from continuing to the summit. During the hike back, we heard thunder in the distance, but before we reached the cars, the rain stopped. Although the rain and thunder were short lived, people were wet and chilly, which would have been unpleasant for trail building. As it was, we were able to make an early return to warm, dry houses. 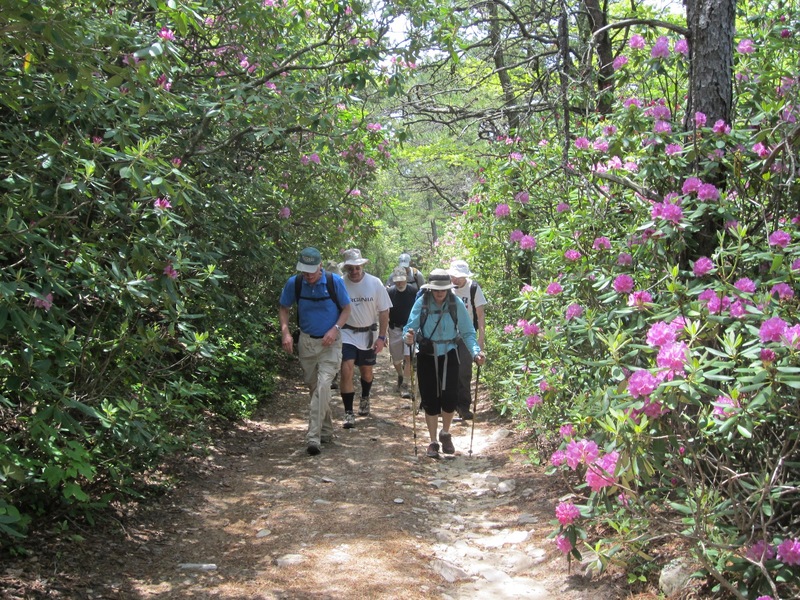 The hardy hikers included Joanne and Maynard Davis, Andy Willgruber, Dan Ralston, and Lindsay Brown. 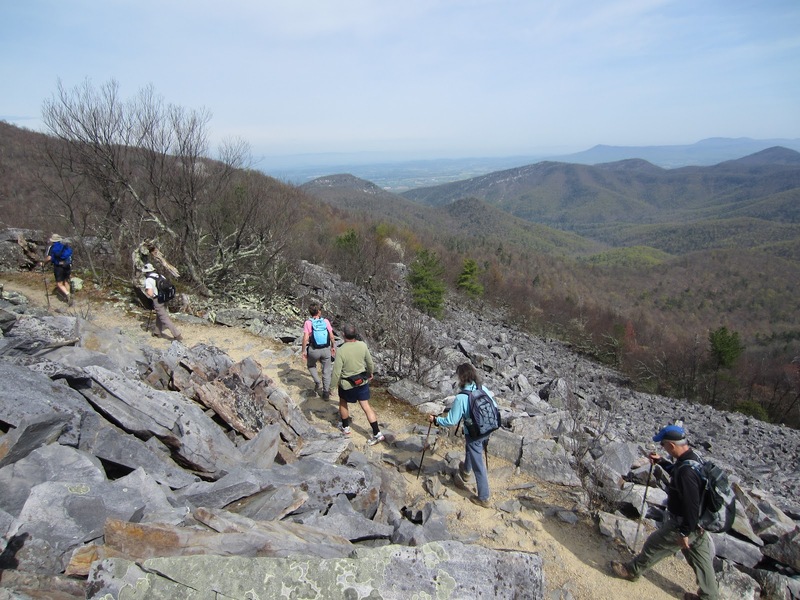 The forecast was for rain, but 6 dedicated trail volunteers from Charlottesville joined the Shenandoah Valley Chapter for a joint work trip in Ramsey's Draft Wilderness. 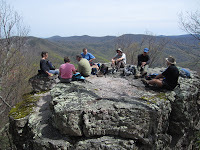 Dan Ralston, Eric Christensen, Ken Moss, John Brandt, Bill Holman, and Iva Gillet left AHS and headed over the mountain to meet 10 members of the SSVC PATC for work in the wilderness followed by a potluck. 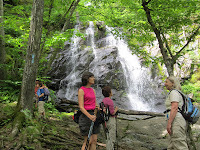 Valley chapter president Karen Waterman and Lynn Cameron had organized yet another work trip in Ramsey's Draft, which have extensively improved the conditions of this 8 mile Wilderness Trail from constant climbing over huge downed trees to a picturesque hike through the former old growth hemlock forest, now standing dead from the wooly aldelgid invasion. 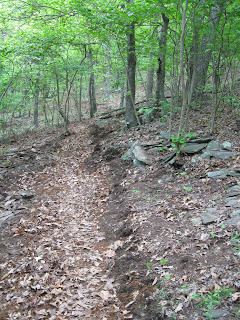 This trail crosses Ramsey's Draft Run multiple times, making timing critical when hauling large tools for trail work. As a wilderness area, no power tools or wheeled vehicles are allowed, meaning that even the trees more than 12 inches in diameter must be cut with hand saws and MAN (and woman) power! With so many workers, we were able to spread out- Ken Moss and John Brandt forged ahead to asses the needs about 3-4 miles in, as previous work from the Valley chapter had made the first 2 miles park like. Bill Holman, Eric Christensen, and Mike Waterman worked for 2 hours on an 18" tree trunk, later to be supervised by Malcolm Cameron. Meanwhile, Jeff Monroe and Gracie arrived to lend assistance after an early morning shopping trip at REI, as the fanatical gear-head shopper that he is. Some people will drive 140 miles just to save a few bucks!! 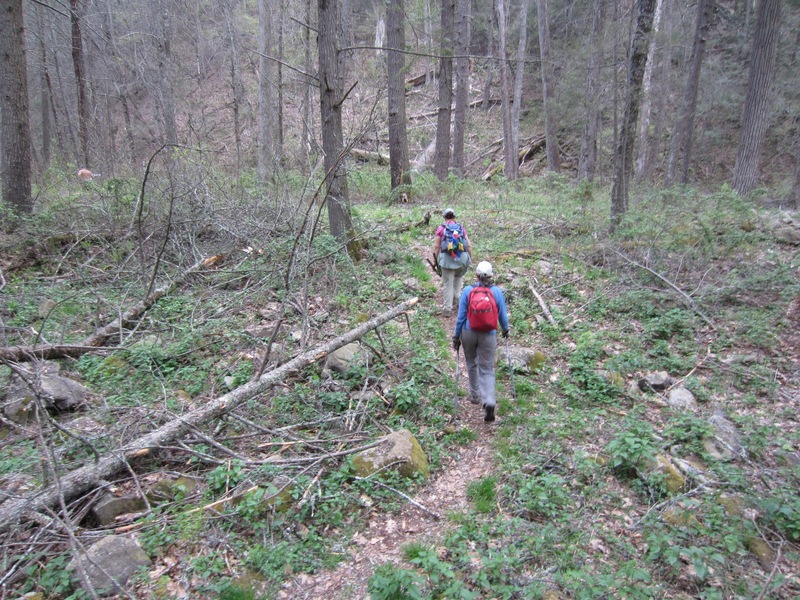 Further down the trail, Karen, Lynn, Dan and Iva worked on a downed trees with Corona saws, finally conceding that it would be much faster work with a proper saw, so onward they went. 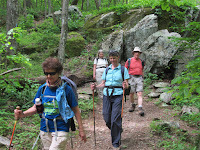 We stopped and joined Nancy Hall, Michael Seth and others for lunch, and since Iva had the hiking cookies, the group was pleased. We then set to tackle a very large downed tree with collateral damage. John Brandt, Dan, and Ken worked engineering processes to move the large limbs and clear a path around, while Nancy, Brian Bruns, and Karen cleared away the debris. 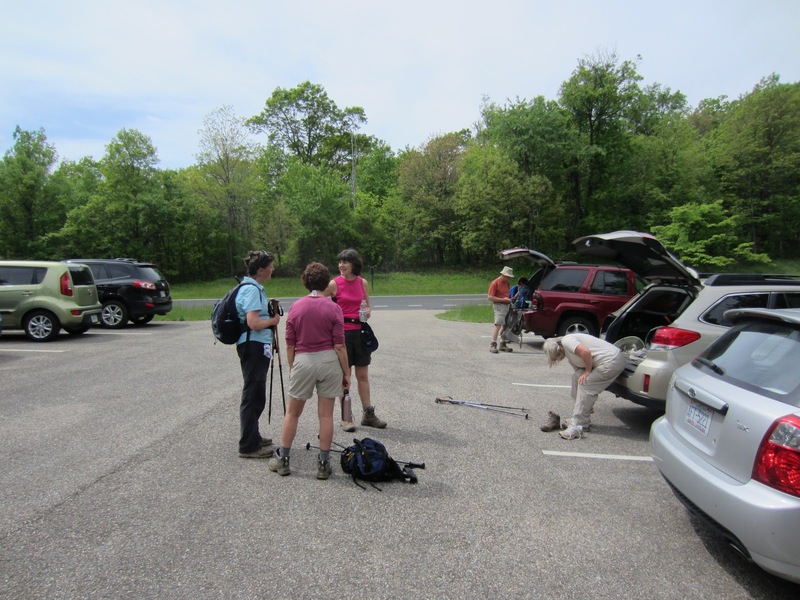 Once this was accomplished to the best of the group's ability, and after several groups hiking through expressed their appreciation, we retreated back toward the parking lot. Bill Holman met us, coming to lend more support to our efforts, but with the darkening clouds, we all decided to head for the potluck. The rain fell, and we donned our raingear as prepared hikers do. Upon joining the rest of the group, Lynn decided that we would use a shelter they had reserved in Churchville for just such weather for our potluck. 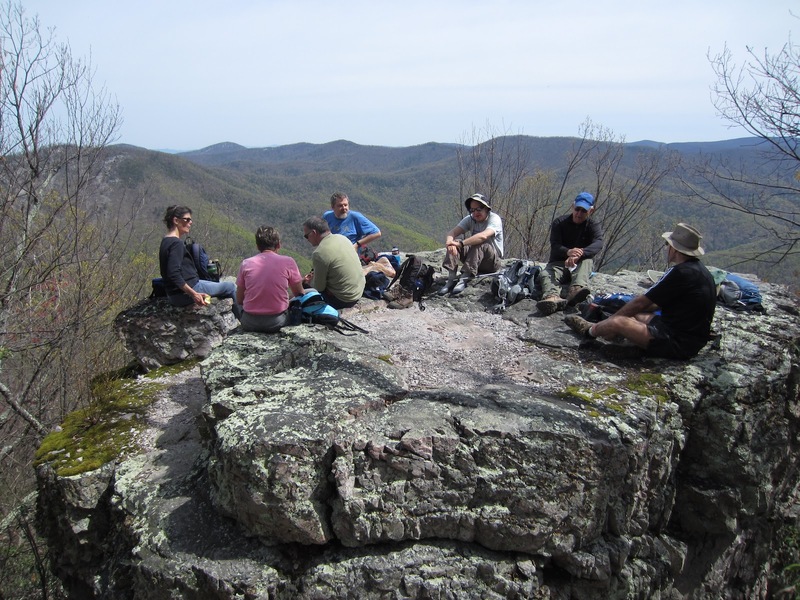 Good food and a chance to chat with fellow wilderness lovers, our chapters have planned a joint hike in July on Shenandoah Mountain to get together again. We are pleased that a good day of group work will allow this incredible area to be enjoyed by many more without constantly climbing over downed trees. We were grateful that the rain held off long enough for us to get substantial work done, and we look forward to hiking this area again soon. Go check it out! A beautiful cool morning greeted the 8 hikers for today's outing. We met at Albermarle High and headed out in two cars shortly after 9am for Shenandoah Park. 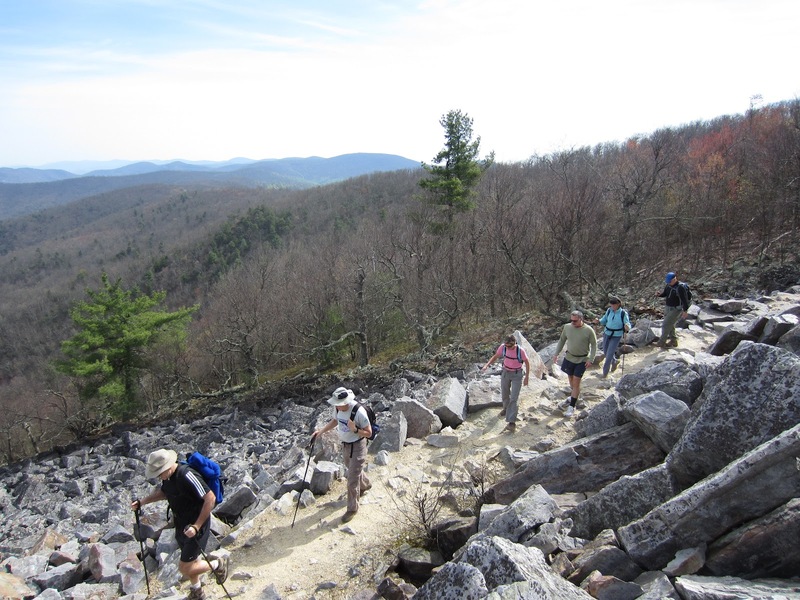 The hike began in the Blackrock Parking area at MP 85 on Skyline Drive. 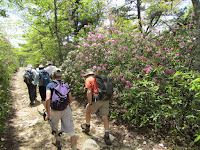 We hiked up the approach trail to Blackrock Summit before descending on the Austin Mountain trail. 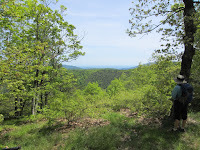 After a short distance we turned onto the Furnace Mountain Trail, then to the summit trail arriving at the peak at noon, precisely as planned. 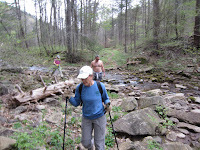 Not many other hikers out today except for one John Brandt "look a like" and a small group coming up from Madison Run. 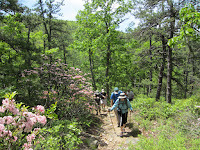 Hikers included the real John Brandt, Eric Christensen, Dan Funkhouser, Sue Tansey, Joanne Davis, Brad Young, Ken Moss, and Hike Leader Lindsay Brown. 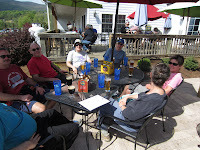 The 7 mile hike ended early so we headed to Blue Mountain Brewery for post hike refreshments. A pretty good way to spend a Saturday!